On damage mode ever since the George Washington Bridge scandal derailed his 2016 campaign, Chris Christie must prove that he's not totally out of the game. 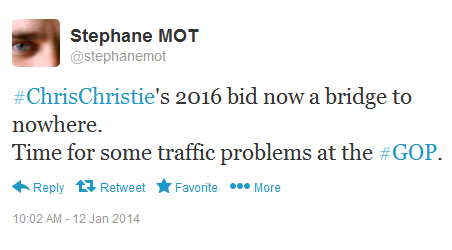 Chris Christie's 2016 bid now a bridge to nowhere. 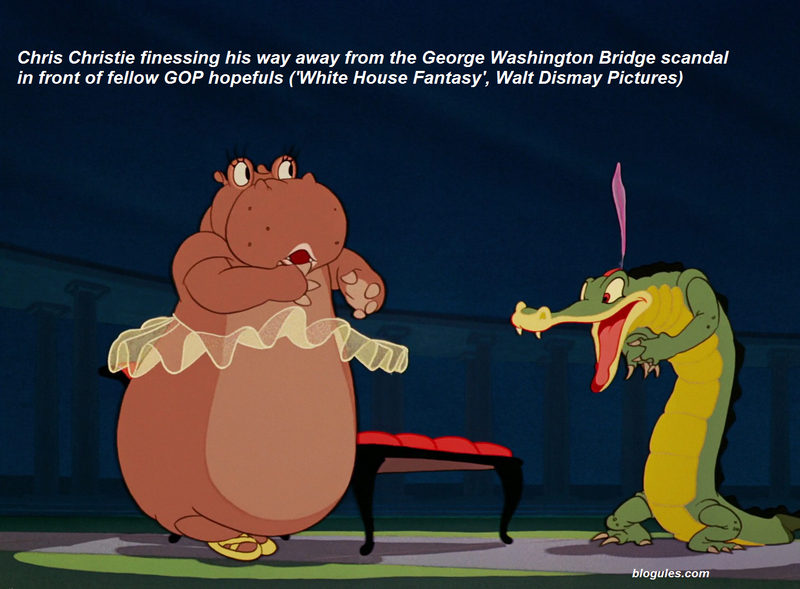 Time for some traffic problems at the GOP. Robert Gates didn't wait for the crash to submit his own resume, attn potential candidates looking for a running mate able to work for BOTH George W. Bush and Barack Obama. In his memoir, "Duty", the former Secretary of Defense even added some Veep Debate credentials for 2016 by slamming Joe Biden's inconsistent foreign policy record. As if serving Dubya and Obama were consistent... His successor Chuck Hagel looks weaker, but he stands his ground. Meanwhile, the GOP continues to postpone its unavoidable reform*, and to make do with tea partiers, theocons and other anticons. With snafued enemies like these, Hillary Clinton can sleep without a worry until the Primaries. Unless, of course, the 800-pound gorilla manages to rock the dance floor. * see "Grand Old Parting - enter the anticons"
Below, a list of blogules spilled over the year 2013.
. "Happy New Year 2015"
. "I met KIM Jong-un - and lived to tell the tale"
. "Trading cards, then and now"
. "An interview in and about Seoul"
. "The Rising Sun Flag Brought Shame Upon Japan - Ban It"
. "Booz Allen is watching you. Saving Private Snowden or Saving Public Manning? (Outsourcing intel in Patriot Act times - When Big Data meets Small Government)"
. "The main threat against Japan? Its own leader"
. "The Sand Curtain, Two Years Later (or is it 20?)"
. "Dear Japan, Say No To Fascism" . "Iron Lady (Ashes To Ashes, Rust To Rust), Meet Hugo Chavez"
. "Invasion of Iraq: The Bush Legacy in 3 Impostures"
. "Still The Worst President Ever"
. "HGTP (Hypergraphia Transfer Protocol) Turns 10: 03/03/03 - 13/03/03" . "Smile, you're on Candid Democracy"
. "Won by cheating, lied to America and the World"